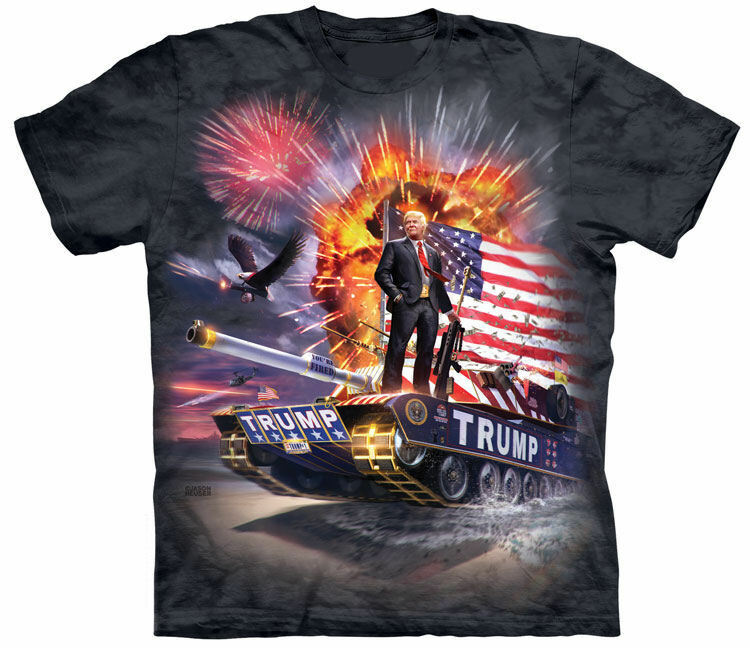 Donald Trump shirts are now in stock! Donald John Trump (born June 14, 1946) is an American businessman, billionaire, television personality, author, politician, and the Republican Party nominee for President of the United States in the 2016 election. He is chairman of The Trump Organization, which is the principal holding company for his real estate ventures and other business interests. Born and raised in New York City, Trump is a graduate of the Wharton School of the University of Pennsylvania with a Bachelor of Science in economics. While attending college, Trump worked in his father Fred Trump’s real estate and construction firm. He assumed control of the business in 1973, later renaming it The Trump Organization. During his career, Trump has built skyscrapers, hotels, casinos, golf courses, and numerous other developments, many of which bear his name, including Trump Place in Manhattan. He briefly sought the Reform Party’s nomination in the 2000 presidential election, withdrawing prior to any primary contests. Listed by Forbes among the wealthiest 400 of The World’s Billionaires, Trump and his businesses, as well as his personal life, have for decades received prominent media exposure. He hosted The Apprentice, a popular reality television show on NBC, from 2004 to 2015. In June 2015, Trump announced his candidacy for president as a Republican, and quickly emerged as the front-runner for his party’s nomination. His platform includes opposition to trade agreements that he regards as unfair such as NAFTA and TPP, renegotiation of NAFTA and U.S.–China trade deals, immigration enforcement including the building of a wall along the U.S.–Mexico border, reform of veterans’ care, replacement of the Affordable Care Act, and tax cuts. Trump is a strong proponent of law and order. He has suggested a temporary suspension of immigration to the United States from nations having a “proven history” of terrorism against the U.S. until more precise vetting techniques can be put in place to screen out potential terrorists; he also believes that the quick defeat of ISIS is mandatory. Trump’s presidential campaign has received extensive media coverage and international attention. His statements in interviews and at campaign rallies have often been controversial, with the rallies sometimes accompanied by protests or riots. Trump received a plurality of the votes in the primary elections and placed first in a majority of states, culminating with a victory in Indiana in May 2016, whereupon his remaining Republican rivals suspended their campaigns, and Republican chairman Reince Priebus declared him to be the party’s presumptive nominee. Three weeks later, Trump had secured the 1,237 delegates needed to secure the nomination, and in July he was formally nominated at the 2016 Republican National Convention.